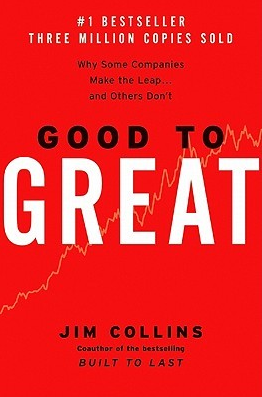 Home › Book Review › Good to Great: What does it take? That pumped me up to read this book… but I am hoping that the author will not draw the conclusion that patience and blind faith are not the the key elements in making the jump from “just good” to greatness. You see… the intro is EXTREMELY boring. The author goes into detail on how and why the research team a set of companies to analyze. He lists in detail how many people, how many hours and how many pieces of paper they spent writing the book. At some point the says how many gigabytes of memory all the research combined takes in a personal computer. Either they are very insecure or the publisher assigned them a minimum number of pages. The author also tries to convince the us that he had no clue where the book was headed when they embarked on this HUGE project. I call BS on that. I will find out later on but I am pretty sure they started from a theory and tried to prove it. How can you start a book and not know where you are headed? That does not sound right to me. By all means I am going to read the book later this week. The author makes reference to “Level 5 Leadership” and that sparked my interest. I am going to take Sakura for a walk and decide if I want to read a book about talent or personal branding next. « Connecting to People: Dog Walking.